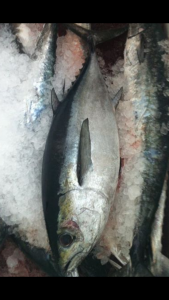 Blackfin Tuna: The blackfin tuna is one of those fish like the wahoo that we do not catch very often. But when it happens, they are more than a welcome surprise. The tuna will fight fin and scale to the bitter end. They never stop pulling because its tail never stops until the fish expires. The fish are warm blooded, so once in the fish box, they need to be chilled fast for optimum freshness. Blackfin Tuna Fishing Tips: The blackfin tuna are caught by a variety of different methods. We used to chum for the tuna behind anchored rock shrimp boats, but the lack of shrimpers in the past few years has all but eliminated this method. Now, the majority of the tuna are caught while live baiting. Some are caught while trolling for dolphin, wahoo and sailfish. Occasionally one is caught while bottom fishing. When this happens, the tuna usually grabs a live bait on its way to the bottom. If you’re not eating the tuna raw as sushi or sashimi, most people grill or blacken the fillets to rare or medium rare, like a good steak.